This is It! A Concrete Plan for Parents who Want to Start Free-Ranging! 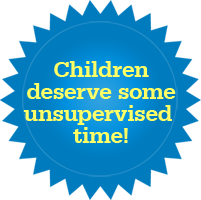 This is an amazing new tool — simple, clear, interactive — from Outsideplay.ca (Canada) that helps parents see the importance of giving their kids free, unsupervised time AND make a concrete plan to bring that about! Developed by a team led by Marian Brussoni, an Associate Professor in the School of Population and Public Health (SPPH) and the Department of Pediatrics, Outsideplay.ca walks parents through their priorities for their child and common concerns about playing outdoors to help them develop an action plan for changing their approach to outdoor play. increase in the number of reported injuries. “You still need to manage risks and hazards, but not automatically default only to safety,” she said. I just walked through the app myself. It asks questions about what traits we want to see in our kids, what WE did as kids, and what traits those activities developed in us, like confidence, and problem-solving skills. Then it gives really simple scenarios like, “You’re walking your child home and he sees some friends walking. Do you let him join them?” And a decision tree shows the consequences of a “Yes” or “No” decision. It is really easy to use and it may be just the solution for parents who are interested in Free-Ranging, but aren’t sure how to start. At last! An easy way to get used to sending your kids outside! Click here! Did Freud (or His Mis-intepreters) Create a Nation of Over-worried Parents? 12 Responses to This is It! A Concrete Plan for Parents who Want to Start Free-Ranging! SO AWESOME. Sharing as widely as I can! This is really cool, I live in BC and my kids go to an outdoor school. But I did not know about this. I’ll be sharing it widely. It’s a good start. Let’s start normalizing childhood again, as it was intended to be, as most of us have experienced it. And our parents, and grand parents, and their parents. etc.. Thanks Lenore! There are real reasons a parent should not be watching their child play all day. All of my mom instincts go off when I see my kids climb a tree too high, jump too far, run too fast… I am so worried they will get hurt and my instinct is to say “don’t do that”. I know I did all of these things too and sometimes I got hurt, usually I didn’t. My kids were at wall climbing class, actually bouldering, where you climb without harnesses and the floor below is very padded. But I still couldn’t help but cringe when my youngest, my baby (who is not a baby at 5 years old) climbed almost to the top. So I turned my head away. I know I stifle my kids energy, learning, abilities and creativity if I watch then run and play all the time, so I have to let them go off alone and trust that they will be ok. I think it’s really awesome that you push past your fear! I wish more people were brave enough to do that. Anxiety is a ‘bully’. The more you give in, the more it pushes you around. When a person is suffering from a bully, there’s always that fantasy of, “If I just do what the bully says, perhaps they’ll leave me alone”. It’s the same with over-protection. A person can cling to any excuse to justify why they stifle the child’s growth. Living according to a set of beliefs that you think are true and helpful is both easy and common. You can easily stick to familiar ways of behavior simply because you THINK that this is the way to conduct your life. It’s easy to fall into a rut of unquestioned obedience to the familiar. I say again that I applaud MR. She’s doing something that’s both not easy and not common. (for her) In some ways, you’re doing more for the free range movement than some people that have already embraced the free range outlook. Lately, these apartments have been undergoing a multi-million dollar renovation project. As a result, there’s a lot of abandoned construction debris that my children have been putting to creative use. Yesterday, they were in the middle of propping up sheets of particle board to form a clubhouse when one of the maintenance guys shouted at them to “knock it off,” and it wasn’t safe, and he’d call their mother. He never did find me. But he’s not going to like it when he does. 🙂 I’ll have a print-out of Outside Play’s manifesto ready. (And no, they can’t get sued. Our contract indemnifies them). To LGB – that’s awesome about giving your kids free range to play with discarded construction materials. I lived in one of the first houses in a new neighborhood from age 7 onward, and spent countless hours scavenging scrap lumber, old nails, etc, to add to my treehouse in the woods. Time. Of. My. Life. I now am a successful writer and graphic designer…. yes, creativity for a living! I largely credit this to being able to create new worlds with found materials outdoors. I probably got a bruised thumb now and then, wielding a hammer with my 8-year-old hands, but I lived to tell the tale. Wish I could get someone to build in my well-established neighborhood so my kids (ages 7 and 10) could do the same stuff. My little girl would love that! So, 1% of the time, does the daughter fall out of the tree and require a trip to the emergency room? While the other 99% might be joyous experiences, and sacrificing 99% of personal growth oppportunities to avoid 1% of expensive problems, assuming that all risk is eliminated is not exactly a healthy approach either. If it costs $2,000 when she breaks her arm, each tree climbed costs $20 on average. Some tree-climbing is good for the soul, but repeated trials of low-risk things probably errs on the side of being too encouraging of risk-taking. I just tried the app and am really shocked at how terribly children’s freedom to make their own decisions is denied to them in the US! Living in Germany, all these scenarios seem pretty normal for a child at 6 years – to be honest, I would (and do) allow them to my 4-year old daughter already (apart from walking home on her own as she’s obviously still too small for it). However, she is encouraged to play outside with the neighbour’s kids all afternoons and remains outside unsupervised by any adults most of the time cycling, climbing, feeding animals (on the farm where we live), etc. I’m really glad that an app like that is not yet necessary here – although it already starts getting more difficult as more and more parents start worrying and over-protecting. Keep up the good work and let your kids roam around as much and as happily as possible!! Nice. I’ll make sure to share this with one of my cousins who was called out by her teaching co workers, on Facebook, for building a fort for her kids. She was also lectured because her son was excited about playing Zombie hunter in his new fort. THE HORROR!! I recall having a club called The Monster Squad (before the movie) at his age. We met at lunch every day to set out invisible monster tracking watches and formulate plans to catch big foot and dispose of all the classic horror characters. This is surely the sign of a sociopath today. It’s wild when you look at how many countries this, the fear, has happened in. I’m always happy to see people point it out and yell LOOK AT AMERICA!!! when it starts getting out of hand. Thanks for featuring our work, Lenore! We are hoping that this will help change social norms for today’s children and parents. We’re about to launch a study to see how effective it is.